Quality time with loved ones is always a good thing, but it’s even better when you can do it with fun party games. 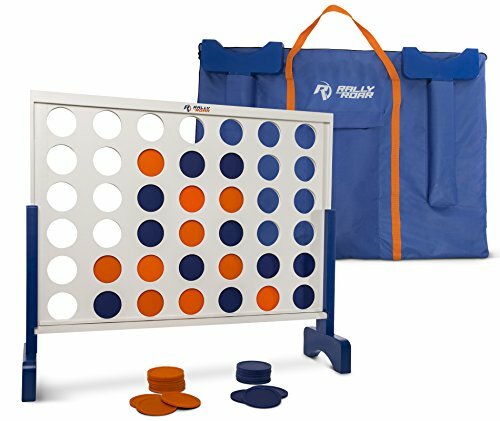 The Rally and Roar Giant Wood Connect 4 Game Set with Carry Bag is just the thing to liven up any get-together. Easy to learn and play, this indoor or outdoor game can be enjoyed by people of all ages. Simply take turns dropping your blue or orange discs in the slots and be the first to get four in a row to win the game. When done, just slide the wooden bottom bar to release the discs. It’s really that easy! This popular bar and yard game comes with 42, brightly-colored, orange and blue coins that hold up to the rowdiest of crowds. With a frame derived from pinewood and a high-quality canvas bag, this connecting-the-dots game will last you throughout the years - for every barbeque, pool party, family game night, camping trip, wedding, graduation, Christmas, and tailgate. This giant wooden connect 4 game is the perfect accessory for any get-together or just some quality, one-on-one time with a loved one. CONNECT WITH FRIENDS AND FAMILY: This exciting, all-inclusive outdoor family game is a popular life-size kid's game with a twist. Play it at home, outside, at a birthday party, or BBQ. This game for all ages will keep everyone entertained for hours. PREMIUM CONSTRUCTION: Our jumbo four-to-score game is made of sturdy, water- and pest- repellent pinewood that is superior to the plastic our competitors use. With colorful chips and a durable canvas bag, this kit is premium quality you can rely on. GO BIG OR GO HOME: This two-person mega connect-all-four activity set stands 3 feet tall and comes with 42 discs that are each 4" in diameter , making this kit larger than life. Keep the party going with our multi-person adult drinking games. GREAT FOR KIDS: Are your days of frat parties and college soires long gone? This kid-friendly game is similar to tic-tac-toe, so it's easy to learn and play. Even toddlers can join in on the activities. Family game night just got more exciting. FUN ON-THE-GO: With a sturdy carry and storage bag and simple assembly, this 4 in a row travel set is easy to transport and set-up. Include the combo pack at barbecues, camping trips, weddings, birthdays, pool parties, tailgates and backyard activities. If you have any questions about this product by Rally & Roar, contact us by completing and submitting the form below. If you are looking for a specif part number, please include it with your message.